Slice the cabbage, remove the tough stem and thinly slice. Place in a large pot with all the other ingredients but the meats and add 1 cup water. Bring to a simmer, then reduce the heat, cover and gently cook for 1½ hrs, stirring frequently. Add water if needed - the fresher the cabbage the less this is needed. Add the meats to the cabbage gently simmer for 10 mins. Remove the lid and cook for 10 mins. 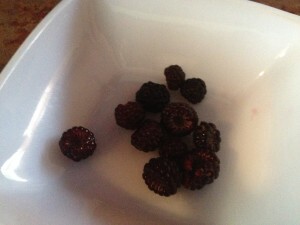 First wild Raspberries of the season. A few little wizard ha shaped berries. 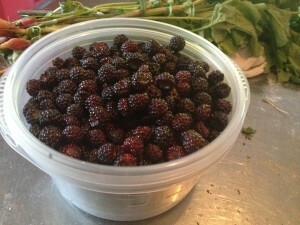 In Tennessee, wild raspberries taste much sweeter than the blackberries to come in July. They tend to grow right by one another and locals often call any wild growing berry that is black a "blackberry" but don't be fooled. These little treasures have a short season and are well worth fighting the poison ivy and chiggers over. After the first sets of berries start to arrive, it is a good idea to take along a tupperware on evening country walks and collect what is ready. What can;t be eaten fresh preserves well in the freezer. This year, it took about two weeks from the first glimmers of wild raspberry goodness to a yield that would support the baking of a pie. A quart of wild raspberries is where you start for seasonal summer pie. Confession: If you know you will be adding some sugar and baking it in a crust, you can harvest some not less ripe, tart berries. These go well in a pie, keeping it from being sickly sweet. Thanks to the modern world, my favorite berry pie recipe is housed online. It has all the elements a busy hobby-farmer needs: simple ingredients that are on hand, no weird pre-cooking undulations to make a filling, a presentation that is pleasing and highlights the flavor of the fruit without the need for trendy cooking channel flair. The 1-2 process is like all pies: Make a crust, pour in the filling. Don't forget the ventilation if you want to avoid a marvelous pie explosion. The key to any pie is getting the crust right, and keeping the edges from burning. After wasting tons of foil crafting my own each time we make a pie, I discovered this $8-10 option on Amazon. Yesterday was the first test of this new device and it worked! A simple, reusable option that is not made from silicone, is easy to wash, reduces the amount of foil headed from my home to the landfill, and will ultimately save me a bit of money that would have gone to yet another kitchen consumable. 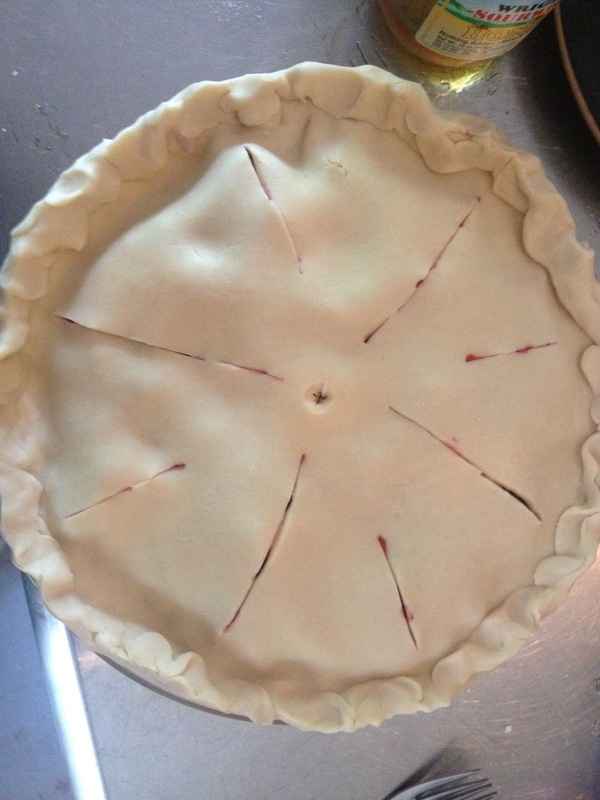 Unlike cake which responds will to the toothpick test, the best way to know your berry pie is done is a visual test. Is it bubbling happily both on the edges and in the middle? Is the crust golden brown? Then - success. The early summer/late spring wild raspberry goody is a great way to get vitamin K and C and provides some hard-t-absorb magnesium to boot! Only a week or two left in the season for wild raspberries in our area. Happy hunting! After 9 hours in the air, and still recovering from walking pneumonia, all I wanted upon arrival in Japan was miso soup. Luckily, we were invited to a Japanese household for dinner. We ate at a special low table with a quilt for warmth called a kotatsu, something that would fit very well at our holler home during the winter. Japanese people can be excellent hosts. I was polite, but a little disappointed. As things were winding down for the night and we were sharing cultural stories, my host asked if there was any traditional Japanese foods I would be interested in trying. Not wanting to impose, I simply asked questions about how different dishes were made and what Japanese people traditionally eat. When miso soup came up, my host got very animated. My host explained that miso is the solid by product that is produced when soy is fermented for soy sauce production. His family made their own miso and he jumped up to show me what it looked like. His wife then showed me how to make it and we all had a round of miso. Place water and seaweed on the stove and bring to a near boil. Whisk in the miso, add tofu cubes. Add a dash of fish sauce. Pour into bowls and garnish with green onions. Most on line sources recommend that you use dashi instead of water, as shown in the video below. I suspect that the above method was used because there was no convenient way to produce dashi on a whim. Recently, I have eaten more miso soup (sans tofu) because it is only 40 calories per serving and thus makes an excellent snack for a woman with a cooking blog who wishes to maintain a certain BMI. It was nice to not that miso soup is not only a yummy low calorie snack, it also has health benefits. Not use too much wasabi - wooowa - unless you need to really clear those sinuses. Keep your rice the right consistency. Lannae Long recently went into much more detail on this than I do. Make the roll thickness consistent the whole length of the roll. Have fun with it - no need for perfection unless you want it - we're doing this at home for kicks. If you want to be a sushi chef, you will need more than my little blog posts on the topic. We decided to do "California Rolls," but with a few personal alterations (like the addition of carrots because I need more vitamin A . We sliced stuff up as thin as we could. We coated our bamboo roller in plastic wrap to ease cleaning. We moistened the Nari and patted down a layer of rice over about 2/3 of the area of the Nari - just the right consistency, carefully added a tiny amount of wasabi for flavor and carefully laid out the veggies and crab in neat rows. After that, we rolled the stuff by putting a bit of extra vinegar water on the still exposed seaweed, carefully turning the rice filled part of the roll until the exposed seaweed meets, pulling back on the roller to really compact all the contents, and finishing the roll. Here is where people have the most trouble - the compacting part. You just can't compact a roll too much - the more compact, the prettier and better it will hold together. I usually ruin 1-2 rolls if I have not rolled in a long time because, guess what? I don't compact them enough. We set the table, had a toast and began our meal. BTW - It was grrrreat! Thank you to Jim Kidwell who taught me to do this.